As the Voice of Generation Z, Morissa Schwartz uses her position as a young bestselling author, digital entrepreneur, and media personality to advocate for the new generation. She is the owner of GenZ Publishing, a thriving publishing company with over 50 authors signed and multiple bestsellers. Morissa’s mission is to positively change the world one word at a time. She also works with young people and aspiring entrepreneurs and makes them leaders through her talk ‘The Modern World of Work: Why a 9-5 is No Longer Your Only Option,’ where she encourages others to follow their passions and talents to succeed. How would you say your literary and publishing career began? Was there a certain event, person, or intuitive impulse that guided you to forge your own path, especially since you are the founder of an independent publishing house, GenZ Publishing? I trace back my publishing career—well, my literary career—to my dad. He used to read to me every single night before I went to sleep starting from when I was an infant. As I got older, I started to memorize the words he was reading, so he would change up the stories to kind of challenge me. I realized my dad was rewriting those stories and if my dad could rewrite them, I could to, so that started my love for reading and writing. I used to read every single book in my school’s classroom libraries and then they would send me to another class and then I’d read all those books, so I always had this intense passion for reading, which turned into an intense passion for writing. I didn’t turn that into a lucrative career though until high school. My mom suggested I go on this freelancing website for my singing, because I was super into singing at that point. I didn’t get any gigs as a singer at first, but then I found someone looking to have her children’s horror book edited. I had just published my own self-published book about contests. I competed in everything from singing, video contests, and sweepstakes, to writing and magazines…anything I could find. Rather than considering myself a writer, I considered myself a professional contestant. So even though I had written a book, I didn’t think I was going to be a writer. I thought it was just a fun hobby, because everyone made it seem like you couldn’t turn writing into a career. But I saw this woman looking for an editor, and I responded saying that I’d self-published a book and I read this may books a week, and I love reading and writing, so just give me a chance. I’ll make your book great. She gave me that chance and loved my work. She recommended me to another friend, and that friend recommended me to another friend, and before I knew it, I had an online freelance editing business. After that, I started working online for an independent publishing company much like my own. I came up with an idea for a book called Notes Never Sent about writing letters to people to tell them that you’re thankful for things you wouldn’t normally, about showing your gratitude for others. I pitched that book idea to them and they decided that they wanted to publish it. At that time I was in college, and a lot of my classmates congratulated me and questioned how I got a book published at such a young age, because according to them it was impossible. I didn’t have a great answer for them, and thus GenZ Publishing was born, so that I could have a good answer for them, so that I could say you know what, there aren’t very many publishers for young people, but here’s a publishing company just for us. 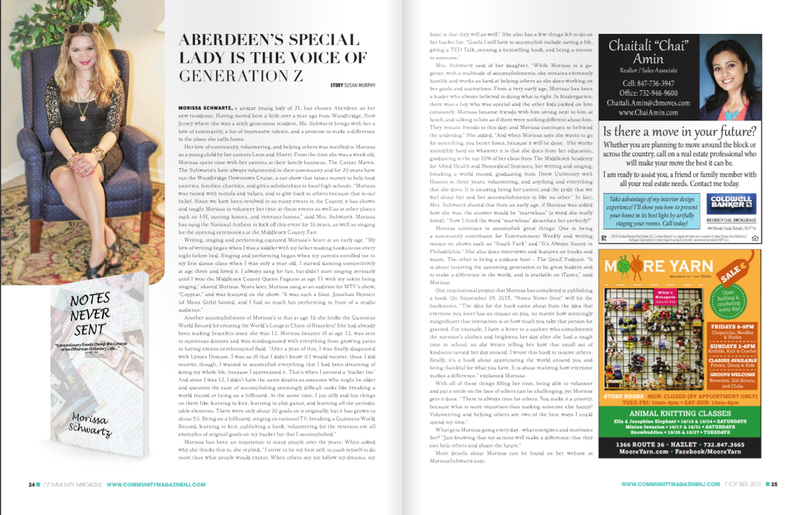 GenZ Publishing was born at first to cater to young authors, but it has grown into catering to authors with something different, innovative authors, new authors, inspirational authors, and that’s really how it all started. Drawing on your experiences as both an author and a publisher, what can you tell us about the publication process? How would you evaluate your own experience with getting your work printed? How has that shifted over time? I self-published my book when I was seventeen, so that was six years ago. I thought that you put a book out and it sells itself; people want to read what you write, obviously. I couldn’t have been more wrong. That book sold around ten copies to family and friends, and that was about it. I realized when you’re an author, if you’re going to self-publish, you need to be your own marketer. Even with an independent publisher, you need to help that publishing company to market your book. It doesn’t just sell itself. I kind of feel bad even now, because when I did then publish my book through a publishing company, I thought, “Okay they’re just going to sell my book for me, that’s what they do.” But that’s not true. That’s not necessarily a publishing company’s job. Sure they can help you, but you have to work as a team in an equal partnership. You both have to market that book and work hard to make sure people read it, because people won’t know about your book unless you tell them. That’s really how my view has shifted; I realized you can write a magnificent work of art, but if people don’t know about it, they can’t read it. Was there a particular achievement or experience that opened up the most opportunity for your writing and career in publishing? As a teenager you have low self-confidence, and I never really thought of myself as a writer, but something that really gave me incentive to write was this magazine called Discovery Girls. I was obsessed with it when I was twelve-years-old. I had been reading it since I was eight-years-old, and what I liked about it was that they featured real girls. In every other magazine, it was all just the same celebrities over and over, but Discovery Girls featured girls like me. I wrote this article for them, a two-page article about my experience with Lyme disease and how it inspired me to live each moment to the fullest and to appreciate all aspects of life. They wound up not just publishing it, but the main editor—her name was Sarah Verney—complimented me and said what an amazing writer I was. After the article was printed in the magazine, I got so many letters from young girls saying how my story inspired them, and talk about inspiring me to write more! I realized I really can write, and again because everyone told me you can’t have a career in writing, I thought even if I can’t have a career in it, I can still write and impact people. The following year I got a position with Scholastic and I was a junior scholastic advisor, where they would ask me my opinion on stuff and I would give it and they would print it in their magazine, or I would offer them feedback and suggestions for their magazine. I did that for a year and that was even more amazing feedback. That was a high point of pride for me. But then I entered high school, and I went to a biomedical science academy. The literature was kind of snuffed out of me for a little while because I had to just study science; we barely had English class there, so everything was science, science, science. I kind of lost my writing for a couple years, but it got back on track once I self-published that book and then started freelance editing. What do you consider the hardest part of breaking into the publishing industry and why? That’s a tough question, because a lot of people find it difficult to even pick up the pen and write; they are intimidated by starting. The second part of that is then some people have no problem writing, they like expressing their feelings, but they’re too self conscious or too shy to share their writing. They want to make sure that it’s perfect without realizing that it will never be perfect, especially to you. I think that one of the hardest parts of the publishing industry and writing in general in that regard is having enough confidence to share your work. But the toughest part of the publishing industry I think is getting people to read your work. In this day and age you have to build up a following; you need social media and a website and all kinds of stuff to get people’s attention. I hate to say it, but you have to build your brand as a writer, and that takes a lot of time and effort, so writing isn’t just enough unfortunately. If you really want to be successful in the publishing industry, you need to build up a following. I am a huge stickler for grammar. I recently had a query where every sentence was a run-on sentence. It hurt my head. I hate to be like that, but if you want to be a writer, something that tells me if you’re really serious is that you know the fundamentals of writing, and one of the main fundamentals of writing is good grammar. Another thing I look for is something different. Many people have a very similar idea and you read the same story over and over, just in a different setting. That’s not original. You’re just rehashing the same thing. That’s a huge critique of Hollywood that a lot of people have, that everything is a sequel, everything is just rehashing the same idea over and over, and they say that’s because it sells. But for me, I find GenZ trying to be a little more artistic and creative. I want to see something new. I don’t just want to keep seeing the same stories reused. Of course, compelling characters are a must, and some kind of social commentary is always a plus. As so many writers struggle with revision, what advice can you give about the process? What should writers focus on as they craft their work into a publishable piece? First off, never take edits or revision suggestions as a personal attack. They are constructive criticism and it will ultimately make your writing better. Some authors are great when they get the revisions, and they’re like, “Wow, this person who read my book really gets it and is helping me to improve it.” Others take it really personally and they get offended, and they’re like, “You insulted my baby.” That’s not the way to be. Your writing is always imperfect and the best way to make it as close to perfect as possible is to keep improving it. With the revision process, essentially it’s about getting your work as close to perfect as you can, even though you know it never will be. What you should focus on regarding your craft is to think like your reader. You should have a very strong idea of who your reader is and what they’re looking for, and read it through their eyes. Can you talk about the process of working with an editor? What are standard practices and expectations a writer should have for an editor? Can a writer decide not to make a change an editor suggests, and when is that appropriate? You have to realize the editor is going to have their own style and their own opinions. They are professionals, so you should definitely take what they say seriously; however, in the end, the edits are somebody’s opinions. If you disagree with something they say, you can definitely not implement it. I actually tell my authors very often that these are suggestions. If you disagree with what an editor says, you can disregard it, but if it’s something that’s obviously a fact, like if you need to put a period here or there’s a typo, change that. But if it’s something like, “I think this character would be better with brown hair,” you don’t have to listen to that. At the same time, editors are professionals. They are people that I find are great listeners and are very intuitive and insightful, and they know what readers like. Take them seriously, and don’t take their critiques personally. When working with an editor, you should expect them to clean up your grammar, flow, and consistency, and if they’re a really good editor, they’ll make suggests about the story, characters, and setting. What should writers look for when choosing what publishing house they should trust with their work? The publishing industry can be a rather intimidating place. There are a lot of publishers with specialties. You’ll see publishers who focus on LGBTQ+ books; you’ll see publishers that focus on sci-fi books or poetry books. Most people who aren’t in the publishing industry think there are five publishers and that’s it, but there are so many more than that. Something writers definitely need to look out for are vanity publishers. These are publishers that charge you to publish your book. They often publish just about any work, meaning it’s not going to be as impressive as if you had it published by an independent publisher or by one of the big five. At that point, you might as well self-publish. You should also make sure your values match up with your publishing house; if you’re publishing with a Christian publisher, you should probably agree with their values. For example, my first book was published by a Christian publisher. I’m not Christian, but when I looked through what other books they were publishing, saw how inspirational their books were, and that their values were not based on the Christian religion but on being a good person and inspiring others, I realized that my values did align with them, making it a good match. What tools would you say are some that every writer must have? This all depends on what kind of writer you are. There are planters who just sprinkle their seeds all around and see what falls where, and then there are architects who carefully plan out their writing. I’m a mix of both, so I start out with notes all around, usually post-it notes, and I also have handwritten notes. For my one book, I hung letters all around for inspiration because a big part of my book was letters. And then I went to my laptop and started typing out my notes and typing out my manuscript. So a laptop and notes are big things to have in your arsenal. Additionally, I love Grammarly; it’s a great tool online (there’s even a Chrome extension) that checks your grammar and makes sure everything is correct. That’s really all I use. There are so many apps for story telling and other writing things, but I don’t find much use in those; I’m a little old school I guess. I think notes and a laptop and your imagination are all you need. Also, never underestimate the power of changing your scenery, like going outside and writing in the sun. Just keep writing, keep going. There are so many writers that are so ready to give up or they don’t have enough confidence in their work. Have enough confidence in your work. If you don’t feel like something is working, keep working at it. Realize that what you write is going to be imperfect, but if you keep working at it, you can make it into something. Your first draft will never be close to perfect or good enough to publish, but with your first draft, just get it all out, and then you can essentially go back and rewrite everything. After having successfully accomplished so much, what are your goals? What direction do you see both your writing and publishing career taking now? For a long time I’ve said I wanted to see GenZ go global, and it has. We have authors from all around the world, so I want to see GenZ continue to grow. I want to see some movies come out of our manuscripts; we actually have one in the works. I want to keep expanding GenZ and my own businesses. I call myself a digital entrepreneur because I have multiple online business and I’m starting to public speak about that, so I would like to begin public speaking about digital entrepreneurship. For writing, I’m also writing a book about digital entrepreneurship right now, and that should be out probably by the end of the year, so I’m really excited about it. I just want to keep helping other people to succeed in their writing and to succeed in their online businesses.